It’s a good day when dinner comes with some great marketing ideas. 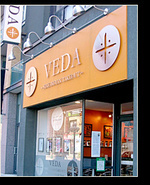 I’ve just come back from ordering at Veda, a new chain of Indian takeouts here in Toronto. Thought I’d share with you some marketing lessons. 1) Positioning. Most Indian takeouts (and I’m from the UK, where chicken tikka masala is the national dish!) are dowdy and cliched – heavy wallpaper, gaudy pictures of India on the wall, sitar music. Veda was different – minimalist, wooden floor, cream walls, well-designed, upscale. This immediately puts the takeout into a class of its own, pretty much eliminating competition. 2) A Unique Selling Proposition. We’ve all had drummed into us the importance of a USP. But how many businesses actually have one? Veda’s is that its food is healthy (a USP that sets it apart from the butter-laden quality of much Indian food). Under the name is a subtitle, "Healthy Indian Takeout", and then under that, "Your Healthy Neighborhood Indian Eatery." And then later on in the menu, in more detail: "Veda: A Healthier Option. Our unique cooking process uses little or no oil in most dishes, This allows us to cook healthier food without sacrificing its great taste." Got the message? It’s a clearly defined USP. Now if they’d offered a membership system (pay a monthly fee for big discounts, for example), or taken my name and contact details in return for a newsletter and special offers… then they’d be on their way to creating a loyal customer. Do you have any takeaways from takeouts?